Rolling into Killarney—after cycling our way through the Black Valley and the stunning Gap of Dunloe — is a special treat. Sightseeing options abound in this "Town in the Park". Built in the 15th century, Ross Castle is located on the shores of Lough Leane and will give you a glimpse of the famous lakes of Killarney National Park. Knowledgeable tour guides love to share tales of the past, making this a truly enjoyable place to visit. St. Mary’s Cathedral is also open daily for visitors. Muckross House & Gardens is another must see historical site. Set on Muckross Lake, acres of gardens surround this 19th century Victorian mansion, which was visited by Queen Victoria in 1861. If you’re not in the mood for history or landscaping, don’t worry, we’ve got you covered! You’ve plenty of opportunities to shop ‘til you drop at the Killarney Outlet Centre or downtown along bustling High Street and New Street. Killarney is one of Ireland’s premiere tourist destinations and its shopping districts do not disappoint! Whether we’ve been shopping, sightseeing, or eating at any of the great pubs along High Street . . . we always end our night a little farther down the road, with a pint or two at the Killarney Grand. 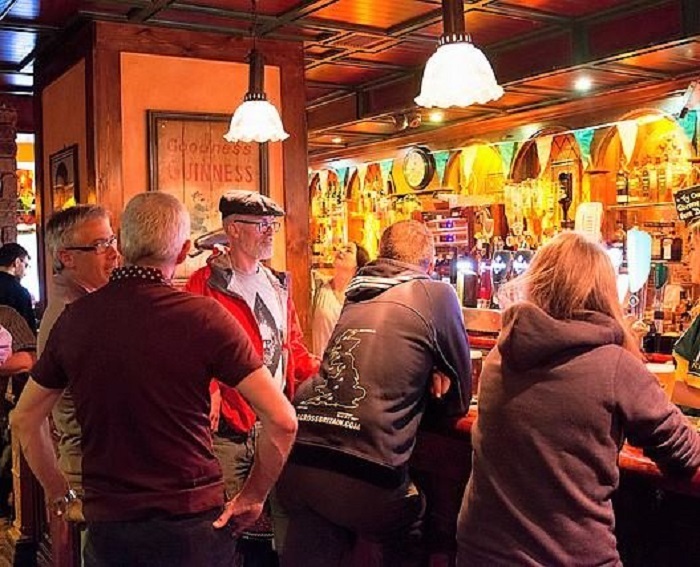 This award winning Irish Trad pub offers up nightly live sessions. There’s no cover before 11:00PM and the place fills up quickly, so grab a seat if you can find one, and settle in for some of the best music you’ll hear in all of Ireland. Our stay in Killarney is always a ton of fun! The locals are warm and inviting, and we love the energy of this vibrant little town. Thanks to Jennifer from Travel-Cycle-Write for helping with the blog!